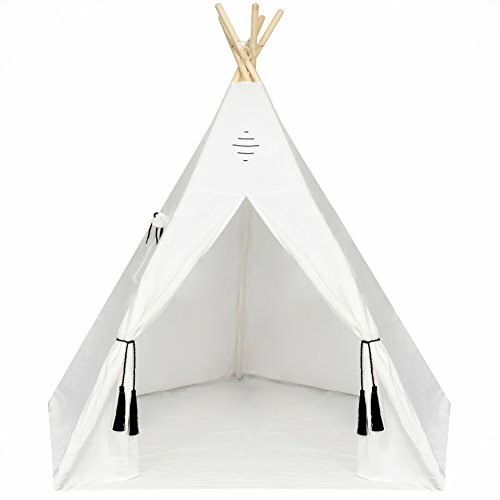 Kids Teepee Tent - Large 6 Feet Tipi with a Floor, Five Poles, Window & Carrying Bag. Foldable Children's Playhouse for Indoor or Outdoor Play. Popular Boys & Girls Gift For Thanksgiving & Christmas. NEW DESIGN! kids' favorite sacred tent to read books, take a nap and play with friends. The ideal size for 2-3 kids to play together. In inch: 47" Diameter x 65 Inches Height. In cm: 105 centimeters Diameter x 135 cm Height. ✔ High quality materials - Designed to last for years. Breathable polyester fabric. 5 Sturdy eucalyptus poles. ✔ Pentagon shape - 5 wooden poles. Award winning design. Mesh window for maximum airflow. ✔ Easy set up - Playtent arrives with step-by-step instructions. Set up takes 5 minutes. ✔ Portable - Comes with a carry case. Easy to fold and relocate to the garden during the summer. ✔ Easy to clean - Using damp cloth & mild soap. ✔ Fast shipping. We ship directly from Amazon's warehouse. 100% SATISFACTION GUARANTEED! LOVE IT OR YOUR MONEY BACK - NO QUESTIONS ASKED! Our playhouse is designed for boys and girls ages 3 and above. Ideal for children's rooms, living room, home decor, front yards, beach, weddings, backyards, parks, parties, day care and more. Click 'Add to Cart' now and get your Tepee tent today! DESIGNED FOR 2-3 KIDS TO PLAY TOGETHER. 5 POLES DESIGN = EXTRA SPACE. Our play tent stretches up to 5.5' in height X 4' diameter. Comes with 5 wooden poles (6' long) to create a pentagon shape tipi - perfect for playing, reading, sleeping & relaxing. NEVER COMPROMISE ON QUALITY. Unlike other teepees here on Amazon, we took a mission to create the best teepee playhouse in the market so your kids will be able to enjoy playing in it for many years. BREATHABLE FABRIC and built-in MESH WINDOW. FOLDABLE. 5 MINUTES SET UP. Carrying bag included. Comes with step-by-step instructions to walk you through the 5 minute process. Thanks to its portability, our tipi tent is a popular accessory in weddings, festivals, beach parties & backyards. FOR INDOOR / OUTDOOR PLAY. Your kids can play with their teepee wherever they want. Great decorative play tent for children rooms, classrooms, outside gardens or when going to the beach. YOUR KIDS' NEW FAVORITE PLACE. They will play, imagine, read, nap, and spend some alone time in their new tent. UNCOMPROMISING CUSTOMER SUPPORT. 100% Satisfaction or your money back! Our customers come first, so, if any problem arises, simply let us know and we'll send you a new tepee tent, or refund your account for the full amount - no hassle, no questions asked. If you have any questions about this product by Nature's Blossom, contact us by completing and submitting the form below. If you are looking for a specif part number, please include it with your message.